Ghosts and flashlights… they’re an interesting mix. 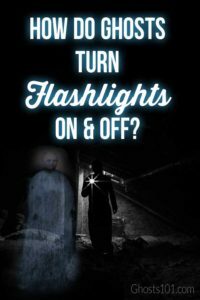 Can ghosts really communicate by turning your flashlight on & off? Ghosts don’t actually turn the flashlight on and off. Not with a switch or lever, anyway. The effect comes from a loose contact between the batteries and the light bulb. A ghost might be able to move the flashlight just enough to make the light blink on for a split second. Or, ghosts might generate EMF energy. That’s a popular theory. If it’s true, a small amount of energy might reconnect the battery and the light bulb. Either way, some ghosts and flashlights seem to have a connection (no pun intended). Ghosts might be able to communicate through a loosened flashlight. That’s how it’s looked in tests on TV and in the field. Use the kind of flashlight that turns on and off with a gentle twist of the flashlight case. The Mag lite brand is the most popular. But, inexpensive clones can work just as well, as long a the flashlight has a metal case, not plastic or resin. Note: I’ve talked with the staff at Mag lite. They were baffled by my questions. They wouldn’t tell me which metals are in their flashlight cases are proprietary. Still, they insisted that conductivity wasn’t likely. So, any flashlight may work equally well. Here are steps to use a flashlight to communicate with ghosts. Twist the case just enough so the flashlight is off. Place the flashlight on a level surface. This kind of real-time communication can be exciting and produce remarkable results. Sadly, there’s at least one big problem: This is far from actual, scientific evidence. Heavy footsteps, a passing truck, a nearby train, or music with a heavy base can be enough to make the flashlight flicker. In other words, a blinking flashlight isn’t proof of anything, even if it seems eerily accurate and consistent. If the answers aren’t at least 75% accurate, I don’t bother with a flashlight “seance.” The controlled responses must be more accurate than a coin toss. If the flashlight responds accurately enough, I set up my equipment nearby. My usual tools include EMF detectors, real-time ghost communication devices, and EVP recorders. We set them up and resume our investigation. We continue to ask questions, and check our other tools for anomalies that happen at the same time as the ghost seems to flicker the flashlight. Flashlight communication with spirits can be exciting. However, I believe you need more evidence, collected at the same time. After our investigation, I look for documented history that supports or refutes what the ghost seemed to tell us via the flashlight. Unless historical evidence exists, the rest is speculation. It might seem reliable, but I’m looking for more than just a consensus from a loosened flashlight and a few other tools. I want something on paper that’s independent of any ghost investigations. That means census records, vital records (birth, marriage, or death records), court documents, and so on. This article wandered far from the flashlight topic. However, “talking” flashlights are such unreliable evidence, they shouldn’t be your only focus in an investigation. Besides… if the ghost really is that communicative, you might miss other investigative opportunities, like EVP and ghost photos or video. But yes, flashlight communications can work. And, as part of a pre-investigation visit – or during your regular research – the answers can help you identify your ghost and why he or she haunts. Got news for the doubters which I was. I am 54 and never had this happen before. I have a new combat flashlight. You can’t shake it and make the light come on. It takes pressure to switch on. I found it on, on my night stand one night and again 2 nights later. I live alone to honestly no explanation for it. Aside from that there been other things but this one I couldn’t explain away. Sleep tight. Thanks for your insights, Doc! I was skeptical about flashlights as real-time communications tools, until I saw one reply with high accuracy. Then, I changed my mind, and I’ve used flashlights – with accuracy checks, described in my article – on several investigations. Of course, the question remains: Who is replying to us? Is it a ghost, or is this the product of wishful thinking (by someone in the room) gifted with PK? And, if it is something spiritual, is it benign? Is it telling the truth about things we can’t double-check? Or, is it lying with a sinister intent? Like many ghost hunting questions, the answers can’t be guaranteed. Nope. It takes the metal wire inside heating up and expanding and then contracting. Its simple thermodynamics. micah, yes, that’s one reason why a flashlight could go on & off. A loose connection (as I explained in my article) is another explanation, and one technique some ghost hunters use. But, I resist one-size-fits-all answers in paranormal research. Yes, thermodynamics can be involved, but that’s a normal explanation. As researchers, we try to rule out that sort of thing. So, I take Doc Holiday’s report seriously, because Doc isn’t likely to report something unless everything normal has been ruled out, first. I absolutely love the flashlight method. I preferred the candle one because it creates a better atmosphere, but to be fair, using a flashlight seems like a more accurate technique. I’m actually going to try it out on my next ghost hunt. Do you just use a regular flashlight? Thanks for your insights. I use a regular flashlight. Candles do create a wonderful atmosphere, but they can be influenced by so many things, I trust flashlights a little more. Science works wonders cause i tried it with a plastic flashlight and it didnt work. Thats why everyone uses the metal cause its fake. Flame is better i guess. Heather, if it makes you feel better to believe that video, that’s fine. Describing all paranormal flashlight communications as “fake” is not okay. The guy in that video is talking about exactly what I mentioned: normal phenomena that can turn any loosened flashlight on & off. Whether you use a single on-flash for “yes” or one flash for “yes” and two for “no,” I believe you can get intelligent replies in some haunted settings. Since writing this article, I have heard from a few people who had success with plastic flashlights. I prefer metal as – if we’re assuming there’s an electrical (EMF) energy related to ghosts – the metal probably makes their replies easier. Suggesting that “flame is better” overlooks issues that candles share with flashlights. Most notably, vibrations and infrasound can affect flames. And, while you can use a candle lantern or a glass shield (often called a “hurricane”) available at most stores that carry lots of candles, I’m sure you’ll find people “debunking” candle communications with spirits. I do use lit candles to check for drafts – from windows, doors, and electrical outlets, etc. – that could create a false cold spot in a room. However, I rarely use them for direct communication with spirits. If someone is startled by a ghost – a “Dude, run!” moment – and the candle was knocked over, a fire could start. That’s a risk I’m not willing to take. Mostly, it’s not helpful to use generalities like “everyone” in ghost hunting. Everyone does not use metal flashlights. And, if you’re trying to prove that ghost hunting is “fake” or ghosts don’t exist, you’ll find plenty of happy debunkers, practically salivating over what they claim is proof the paranormal does not exist. It’s fine if you’ve already found the answers you’ve sought. Many of us have had extraordinary encounters with spirits and we’re still exploring this field, to better understand it. That doesn’t debunk all real-time communications via flashlight. Almost every kind of paranormal activity can be explained, if someone is a dedicated skeptic. That doesn’t mean that ghosts (or angels, or Deity) don’t exist and don’t communicate with us, at times. If it makes you feel more comfortable to think that all paranormal activity is fake, that’s fine. Those of us who believe in spirits have nothing to prove; we just know when we’ve encountered something extraordinary, and it’s best explained in paranormal terms. Previous Previous post: How much should I budget for ghost hunting gear? Next Next post: How do people use dowsing rods in ghost hunting?